The pricing plan of iContact starts from $10 per month and allows sending emails to 250 subscribers. It has different pricing plans dependent on number of subscribers. Talking about Constant Contact, its pricing plan also starts $15 and but it allows you to send emails to upto 500 subscribers. When we compare these three email marketing tools on the basis of pricing then we see that GetResponse is a clear winner. Trust me or not free trial attracts users towards any email marketing service. Constant Contact, iContact and GetResponse they all offer free trial to their customers. GetResponse offers a free trial of 30 days without demanding any credit card details. You can later on sign up for monthly plan. Constant Contact gives you free trial for 60 days but some of its features are paid only. In comparison to that iContact also gives a free trial of 30 days to its users. So their is a tie when we talk about free trial but still GetResponse can be marked as winner because their free plan is fully free, that means they give access to all its features and don't have any paid only feature in their free plan. • GetResponse got excellent reputation on social media websites like facebook and twitter etc. • Enables you to create impressive email designing or you can use 500 built in templates. Moreover GetResponse also has 1000 stock images. • Enables you to create your own landing page. Landing page also has round about 100 templates to select from. • Auto responder 2.0, that enables you to send event and time based emails. • Inbox preview feature enables you to see how the email will look in inbox of your subscribers. • Advance tracking and reporting tools. • Phone support is not available 24/7. • Interface has some annoying features. • iContact offers you 600 plus customizable email templates. It enables you to choose different layouts and columns ( one column, two column, multiple column). • You can send unlimited number of emails to particular subscribers depending upon the pricing plan you are using. • Message builder enables you to create message by simple drag and drop option. • Sign up forms for web pages and social media websites like face book. • Email tracking and reporting tool. • Ability to publish your archive email on blogs. • Auto responder enables you to send event and time based emails. • Spam policies that minimize the chances of error. • Free trial for 30 days. • Customer support is limited. 5 days a week Monday to Friday from 4am – 10 pm. • You need to contact customer support if you want to subscribe a plan for 15,000 subscribers. • Constant contact is quite popular and its services are used by 600,000 users across the globe. • 98% deliverability rate. That makes sure, 98% of your emails are successfully presented in the inbox of your subscribers. • It enables you to send surveys, registration forms, coupons, collection of donations, promotional emails and much more services. • Good reputation of social websites that grabs users towards this email marketing tool. • 30% discount on yearly package. • Free trail for 60 days. • You need to call billing department in case you want to cancel your plan. I will suggest you one thing that; do not go for any email marketing tool until you are confident enough that you are able to design online campaign. Out of the three tools discussed above, GetResponse is awinner in my point of you. 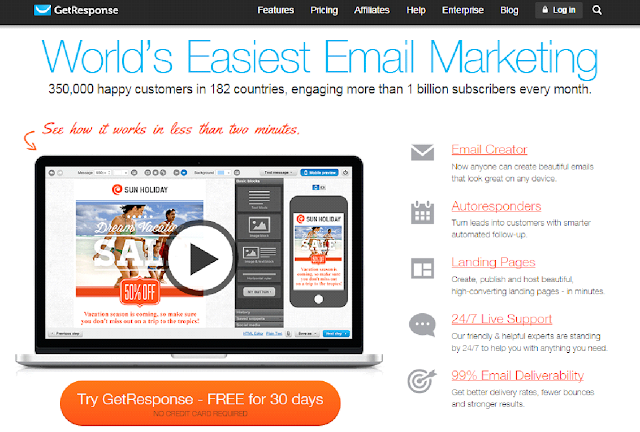 GetResponse is an affordable and suitable email marketing service for serious business groups and for beginners also. You can sit quietly, read the above comparison in detail again and again. And then make your own decision that which email marketing tool has best services and is suitable for your campaign.